“A motion picture starring active-duty Navy SEALs,” scream the movie advertisements for Act of Valor. Slated to open in mid-February, the new movie represents significantly increased media attention on a special operations element that has traditionally shunned the media spotlight. In his Jan. 25, 2012, plenary address to this week’s “West 2012,” held in San Diego under co-sponsorship of the Armed Forces Communications Electronics Association (AFCEA) and United States Naval Institute (USNI), NAVSPECWARCOM Commander Rear Adm. Sean Pybus, USN, directed a slice of his comments toward the movie and the current media situation surrounding Naval Special Warfare. Pybus expanded to another media issue when an audience member asked his thoughts about the new book, American Sniper, by Chris Kyle, and “how true to reality” it was. Beginning with professional praise for the author, whom he described as “very well regarded in our special warfare community,” Pybus expressed his own personal reservations about some of the book’s contents. “I would like to think that your reputation as a Naval Special Warfare operator or enabler would be sufficient when you transition to civilian life … that you would be quietly proud of that and move forward as you transition into your next life,” he offered. “That certainly doesn’t always happen. I think some of our people have a story to tell and they want to tell it. 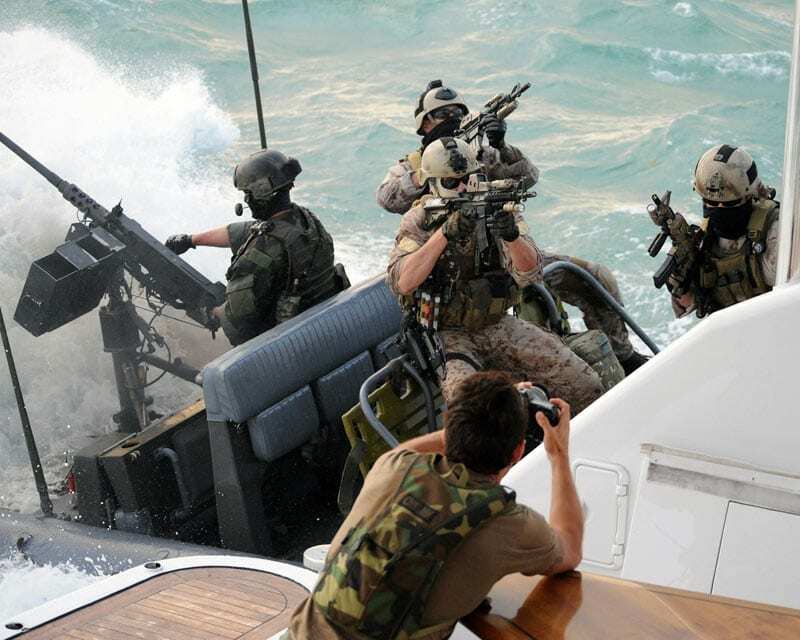 I am always leery of Hollywood becoming involved with the special operations community because in many ways it has a manner of trivializing what our shipmates do. Moreover, it creates sensationalism, which more often than not is inconsistent with life in the real world. The success of our special operations community comes from the collaborative efforts of a great many dedicated individuals representing the Joint Services. Navy Seals bring a special set of skills to the fabric of Special Operations; those skills are but a subset of the total asset base needed to ensure that our nation can respond to forces or states that threaten our nation, and its policies around the globe. Navy Seals have served and continue to serve nobly. That devotion and professionalism is not exclusive. They are neither indestructible nor endowed with divine powers, they are simply professionals. The attraction to become a SEAL comes from a desire to serve one’s country, and to be part of an organization with immense talent and conviction. Most of which is lacking in Hollywood! I enjoyed reading of the on-again, off-again romance between the Navy special operations community and the Hollywood filmmakers. Some key questions are unanswered here — will the Seals who portray Seals in the film receive film credits in their real names? In my opinion, both Sean Pybus and Sal Palma are exaggerating the extent of security that is needed to protect legitimately and properly classified operations. In a free society the default should be openness. We need an open debate about when and how we use these forces. Recently, we used them in a rescue in Somalia that was in response not to an act of war but to a crime committed by criminals. The crime was a kidnapping for ransom and was neither an act of war nor of terrorism. Would the Seals have intervened if this kidnapping had taken place in Nairobi? In London? In Chicago? I would like to see more, not less, openness about the Seals and their work but a commercial movie made with government involvement is not the appropriate way to tell that story. This film is definitely an extraordinary case. It’s not that Hollywood hasn’t had cooperation from DoD to make a film before, because Hollywood has been getting help from DoD for something like a century. And it’s not that active-duty personnel haven’t appeared in films before as extras or with even a little more screen time. But never, as far as I know, have active-duty military had so much screen time, been the main characters of a film as seems to be the case with this one. Even more surprising is that the SEALs and SWCC personnel in this film come from a community that is well known for operating in the dark and avoiding the spotlight. I’ve spent years not running sensitive stories, blacking out or blurring faces in photos, and using aliases or first names only in stories covering the special operations community to an extent that was probably overkill, such was my worry about violating operational security. So it’s a shock to see a film coming out where personnel who were then active duty apparently have significant face time on camera. I’m not making a judgment one way or another. I’m just saying it’s real different. As Rear Adm. Pybus pointed out, these SEALS and SWCC personnel were asked to do this, and I’m sure some of them did it quite reluctantly, as it went against their culture and their personal nature, but saluted and got on with it. I hope this ends up being something they are proud of being involved with and that they don’t end up taking heat for it or regretting it.